The Ragdoll is a cat of contrasts: it has the large, imposing physique of a Birman, but when picked up it relaxes all its muscles to become as weak as a kitten, and as floppy as the doll from which it takes its name. not content with one unique feature, it is also said to have a high tolerance to pain, a characteristic that is thought to be inherited from the original Ragdolls born to a longhaired queen that had been injured in a automobile accident. However, many breeders are adamant that in their experience the Ragdoll’s pain threshold id no different to that any other breed, and that to believe otherwise may be detrimental to individual cats. California in the 1960s was the birthplace of the Ragdoll, largely through the efforts of one woman. It is fairly rare outside the US, where it was recognized in 1965. it has only recently been recognized for showing in Great Britain. The Ragdoll is a cat that is extremely tolerant of the foibles and whims of others, and quickly becomes devoted to its owner. There are three recognized coat patterns for the Ragdoll: the Bicolor has a pale body, a white chest, underbelly, and legs, with a dark mask, ears, and tail; the Colorpoint has a pale body with darker points; and the Mitted has a white chest, bib, chin, and front paw “mittens”, but is otherwise the same as the Colourpoint. The established colours are Seal-point, Chocolate-point, Blue-point, and Lilac-point. 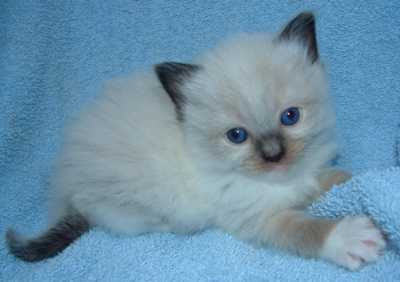 Ragdoll kittens are slow to mature, and it may be three years before the shading of the coat and the point colours are fully developed. Despite the origins of its name, physiological tests have detected no difference between the Ragdoll and other breeds. Wedge-shaped with a short nose and dark brown nose pad. Full, round chin and full cheeks. Skull between ears is flat. Mask is dense, seal-brown, providing a distinct contrast with body colour. Large and oval, set far apart. The colour should be blue. Medium in size and round-tipped. Ears tilt forward. Similar to the Birman; a long, muscular. Solid type. Long, full, and silky. The body colour should be pale fawn, with dark, seal-brown points. Deep chest and heavy hindquarters Coat is usually longer in warm climates, moulting considerably in summer. Fur is extra-long on chest and stomach. Fur is claimed to mat less than is usual for Longhairs, and breaks when the cat moves. Colour shades to pale cream on underparts. Medium in length. Forelegs are slightly shorter than the hind legs. The paws are large and round, with pads that are either dark brown or black. The white “mittens” and boots are clearly visible even at this early age. Dense, seal-brown ears, tail, and mask are contrasted against the fawn and pale cream of the rest of the coat in this variety. The inverted white “V” on the face is characteristic of Bicolours.